Simon Kinberg, the writer-producer behind X-Men: Days of Future Past and the now-in-production Fantastic Four reboot, revealed in a recent interview with The Hollywood Reporter, that he would like to see both franchises come together in a crossover movie. Unlike a potential crossover with The Avengers, which is controlled by Marvel Studios, 20th Century Fox controls both X-Men and The Fantastic Four franchises. 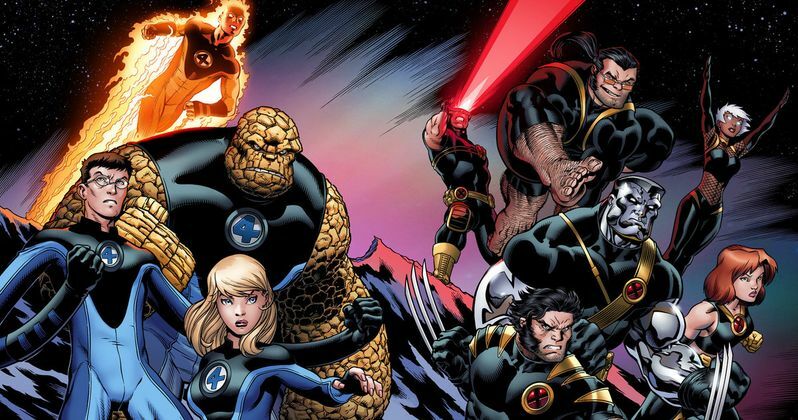 Simon Kinberg says he has been inspired by the universe that Marvel Studios has created, but still refuses to confirm that an X-Men / The Fantastic Four crossover is in the works. "In the world of Marvel Studios and everything they're doing that we've been inspired by, anything is possible. I would say purely as a fan of comics and these film franchises I would love to see it, but it has challenges." He went on to say that, despite both properties falling under the same studio roof, there are plenty of challenges to overcome with a crossover, from a story standpoint. "The Fantastic Four live in a world where they are fantastic because they are the only people who have super powers. If they were to live in a world full of mutants they would kind of just be four more mutants. In the X-Men movies, we have never acknowledged a public team of superheroes called The Fantastic Four who live in New York City, even though Charles' mansion is in Westchester not so far form the city." We reported last month that 20th Century Fox executives currently have no plans for a crossover, but if The Fantastic Four does well in theaters next year, it's certainly possible those plans may change. The Fantastic Four, which is being directed by Josh Trank, stars Miles Teller as Reed Richards/Mr. Fantastic, Michael B. Jordan as Johnny Storm/The Human Torch, Kate Mara as Sue Storm/The Invisible Girl and Jamie Bell as Ben Grimm/The Thing. Would you like to see these characters interact with the mutants from X-Men? Chime in with your thoughts below.